Quest Town Saga is a typical Kairosoft hybrid SIM-town builder-RPG. It doesn’t have the best ratings on iTunes compared to other Kairo games, possibly because of all the freemium elements to it. These include the usual cash-for-virtual gold as well as log-in bonuses, an ad-click plaza and splash screen ads, eg when starting the game. There’s quite an in depth Reddit review here that gives a fairer and more comprehensive analysis of the features and IAP. There is an IAP Adventure Pass that doubles your Daily Login Bonus, involves no stamina loss and has no ads, and gives you extra quest slots – basically a more conventionally premium game experience. If you really want to play this game fully, it’s probably worth getting. Help out the townsfolk and they’ll let you take charge of their town, building it as you like. Plus, you get to be a respected hero. Some get their treasure from quests. Some get items and money from managing a town. But why not both?! Create a party of characters with different Classes, like Knight or Beast Tamer. Have pet monsters fight alongside. Choose your weapons and armor based on the elemental affinity of your foes to hit hard while taking less damage yourself. You can make and add “friends” to your party, I assume these are all actual other players, as you can manually input someone’s player code. They feel fairly NPC however when you select them from a suggested list, this isn’t really live co-op play or anything. But earning Friend Points lets you change your outfit. For the iPhone X, the sprites also seem a bit large and the game world feels zoomed in. The images on iTunes don’t give a clear picture because they’re not actual screenshots (whereas the one on this page is an actual screenshot from my game). The “zoom in” aspect is probably the thing that people will struggle with most – it’s profoundly annoying. Particularly as all the dialogue boxes are tight and bright crisp small text, so why the big fuzzy gameworld? 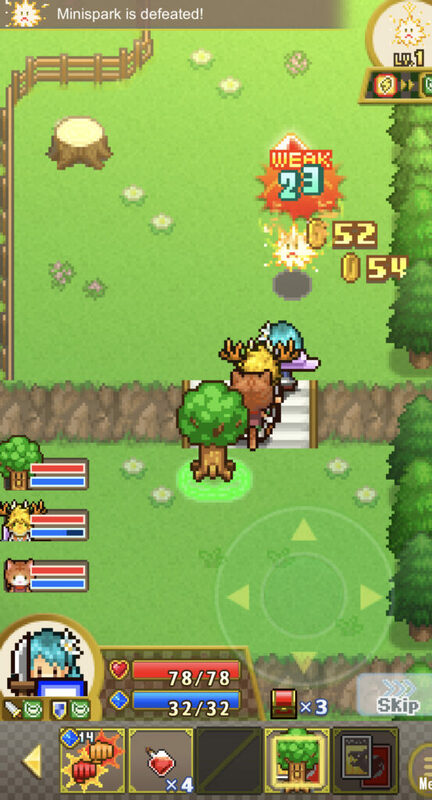 Fans of Kairosoft games should enjoy it, as well as those who like monster hunting elements. If you’re new to Kairosoft, you’ll probably have a better experience starting out with Dungeon Village or Ninja Village or Beastie Bay for the monster hunting/collecting element.